Pipeline Repair Bandages for Large Repair. For repairing and reinforcing leaking, damaged and corroded pipes and pipelines – just dip the resin-soaked fibreglass bandage into water and wrap. SylWrap is a water-activated fibreglass repair tape, which sets rock hard in minutes for a high strength, permanent repair. It works on all sizes of pipe to seal leaks, strengthen and protect corroded pipes. 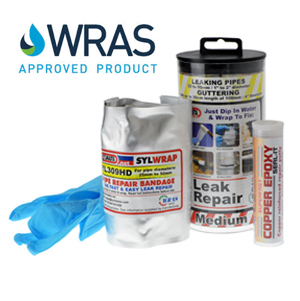 SylWrap is WRAS Approved for use on drinking water and is designed for pipe repairs on pipes made from steel, stainless steel, copper, malleable iron, GRP, ceramic, clay and most plastics. It resists pressure up to 30bar and temperatures of over 200ºC. Sylwrap has been used extensively in industry to repair leaks and damage to pipe work made from materials such as GRP, steel, iron and copper. It has been used in desalination plants, water companies, pumping stations and petrochemical plants around the world. To reinforce weakened pipes, use Sylmasta Industrial Metal to repair any damage and pitting to the pipe and to create a smooth surface. Paint pipe surface with Sylmasta Liquid Metal to provide strong corrosion protection and provide a “load transfer” layer, then overwrap with SylWrap once Liquid Metal has solidified but is still tacky.